The majority of community-acquired cases of infectious keratitis resolve with empiric therapy and are managed without smears or cultures. Smears and cultures are indicated, however, in cases that involve a corneal infiltrate that is central, large, and extends to the deep stroma; that are chronic in nature or unresponsive to broad-spectrum antibiotic therapy; or that have atypical clinical features suggestive of fungal, amoebic, or mycobacterial keratitis. 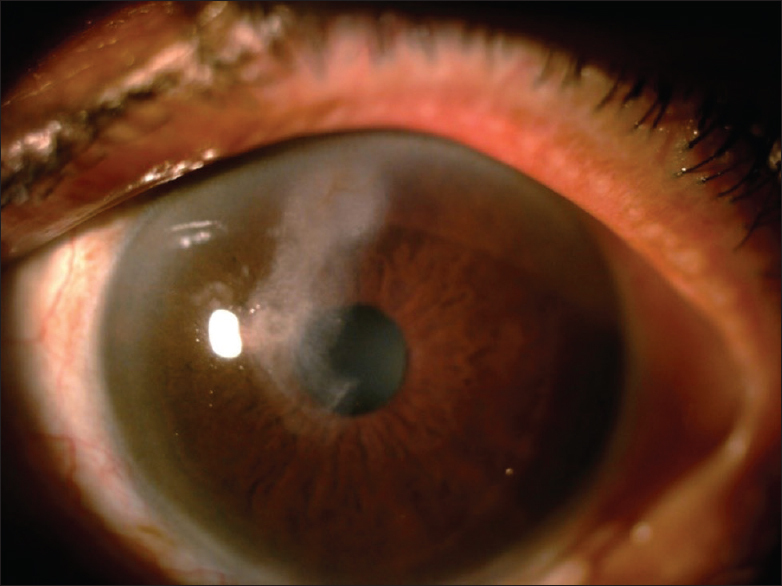 Before initiating antimicrobial therapy, cultures are indicated in sight-threatening or severe keratitis of suspected microbial origin. 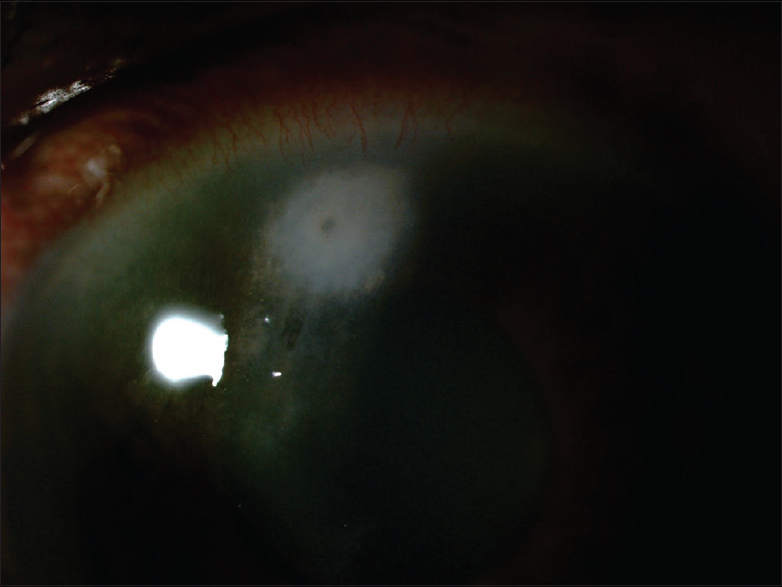 This case report highlights the importance of scraping in the diagnosis and management of corneal ulcer and also need for rational use of medicines. One of the well-known dictums in management of infectious keratitis is performing diagnostic corneal scraping. It provides therapeutic as well as diagnostic benefits in treating the keratitis. But often, the laboratory facility is not accessible for most individual practitioners, which results in irrational treatment of corneal ulcers which in turn may affect successful outcome in the management of such cases. We report a case where role of corneal scraping was highlighted in the effective management of corneal ulcer. A 69-year-old male was referred to us as a case of infectious keratitis in the left eye not responding to treatment. He had a history of trauma to the left eye with leaf of coconut tree few days back. The primary doctor had seen him the day after the injury, and in view of organic matter injury, the patient was started on antifungal (natamycin) along with antibacterial (moxifloxacin) eye drops. After few days of treatment, the ulcer was not seen to be healing and hence antiviral (acyclovir ointment) was also added. The response to treatment was still not satisfactory, and the patient was referred for expert opinion. On examination, the patient had best-corrected visual acuity of 6/6 in the right eye and 2/60 in the left eye. The left eye showed lid edema and intense circumciliary congestion. The cornea showed a vertically linear corneal wound involving central cornea and extending to the superior cornea with a morphology-simulating bulbous head in the superior part and tapering tail toward the central cornea [Figure 1]. The infiltration was extended to superficial stromal layers, especially in the superior part, whereas the tail region showed signs of healing with minimal infiltration of stromal layers. The anterior chamber had few cells, but there was no hypopyon. Media clarity was also affected by early cataract. The posterior segment appeared to be within normal limits. The patient had no known systemic diseases that may have affected healing of the wound adversely. Since there was no clue on the possible organism, corneal scraping was planned. Prior to sampling, antifungal and antiviral agents were stopped. No worsening of keratitis was noted on stopping the medications. An area of suspected descemetocele was noted in the subsequent days in the head area of the lesion [Figure 2]. In view of possible perforation on scraping, an anterior segment optical coherence tomography (ASOCT) was performed to know the depth of the lesion [Figure 3]. 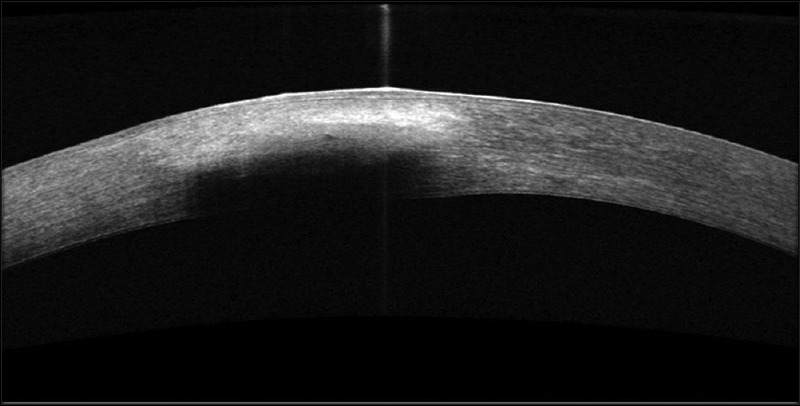 ASOCT images clearly showed that the thickness of the cornea at the lesion was within normal limits, and there were no signs of descemetocele. The image was more suggestive of a foreign body with shadowing. Corneal scraping was performed, and a foreign body (piece of leaf) was removed from the center of the head region of the lesion [Figure 4]. The ulcer healed within very few days with continuation of the same antibacterial agent without need for addition of any other agent [Figure 5]. The patient subsequently regained best corrected visual acuity (BCVA) of 6/6p after complete healing of the ulcer. In the course of management of any infectious keratitis, a nonhealing ulcer or ulcer not responding to treatment should raise suspicion of certain points. The prime suspicion in these situations is on the sensitivity of the organism to the medicines used., Second, infection due to polymicrobial agents should be suspected. In these circumstances, we may get resolution of some parts of ulcer or healing at some stages of disease with worsening later or in other words a situation of partial healing as what we had in this case. In this case, there was no clue on the microorganism nor their sensitivity as a laboratory study was not performed. There are situations where we may have to start the treatment empirically without waiting for the laboratory report on smear or culture. In our case, in order to prove polymicrobial infection or resistance to the medicines used, it is necessary to have culture sensitivity report. The decision to start antibacterial/antifungal and antiviral without performing any microbiological evaluation is irrational as per the current practice patterns., It can only delay the response to treatment due to drug toxicity. Even though the history suggests an organic matter injury, it is very rare for fungal ulcers to present with severe infiltration within a day or two of injury as fungal ulcers are known to be slow indolent ulcers. In addition, there was nothing to suspect viral etiology in this case either from history or from morphology of ulcer. The starting of known epithelial-toxic agent like acyclovir should have been avoided. The third reason we thought of was about possibility of a hidden foreign body which should always be kept in mind in cases of trauma. The answer for all our queries could have been given by corneal scraping which was not done in this case prior to starting antimicrobial agents. Our attempt in this case was to get a clue on the etiological agent based on microbiological evidence by performing a thorough scraping. The pseudo appearance of descemetocele in certain cases as in this case may be one reason for avoiding much-needed corneal scraping. The ASOCT clearly showed the status of the underlying cornea which was not visible on slit lamp and also gave a clue about possible foreign body. This highlights the clinical use of ASOCT in the management of infectious keratitis. A scraping at the very beginning stage itself would have given a clue on the etiological agent or avoided delayed response of the ulcer as foreign body would have been detected at that stage itself. One of the oldest dictums of performing scraping in a corneal ulcer is often forgotten or overlooked. This along with irrational way of adding antimicrobial agents causes more delay and confusion in the management of infective keratitis and should be avoided. 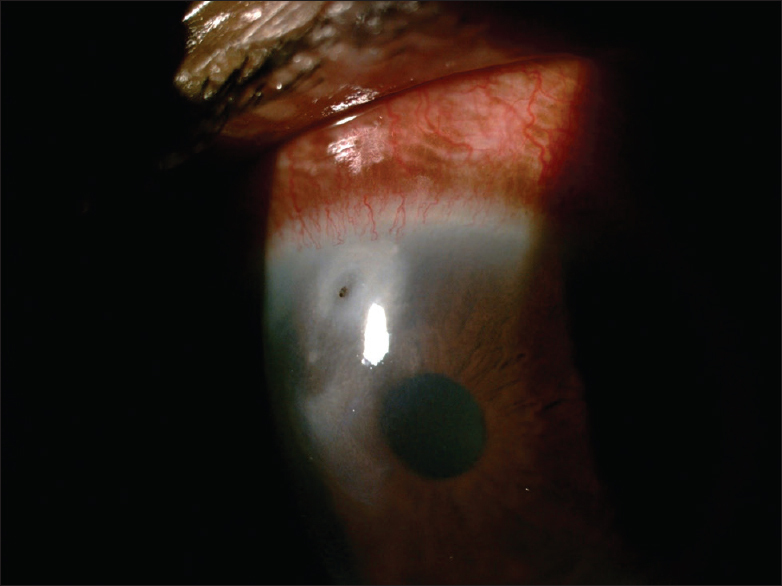 The take-home message in this report is to remind the importance of corneal scraping in every case of infectious keratitis which can prove helpful either diagnostically or therapeutically. 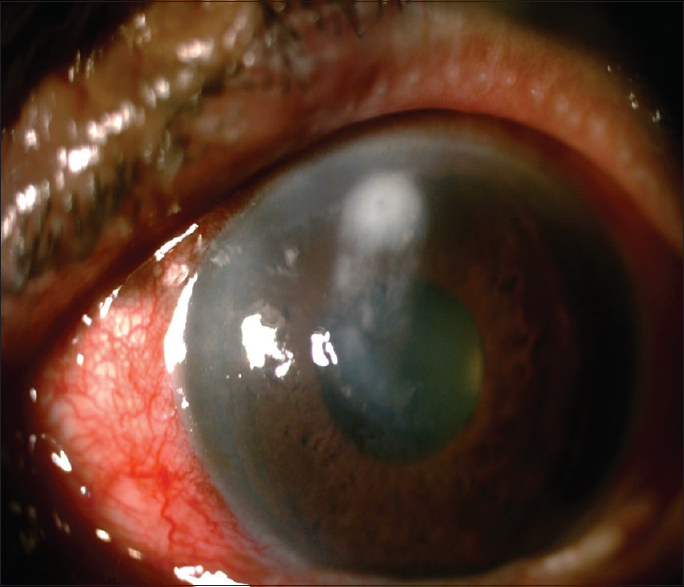 Furthermore, the agents chosen to treat a case of infective keratitis should be based on evidence from the smear or culture, and if forced to start treatment empirically, the agents should be added in a rational way as prescribed in preferred practice patterns for the management of infective keratitis. McLeod SD, Kolahdouz-Isfahani A, Rostamian K, Flowers CW, Lee PP, McDonnell PJ, et al. The role of smears, cultures, and antibiotic sensitivity testing in the management of suspected infectious keratitis. Ophthalmology 1996;103:23-8. Rodman RC, Spisak S, Sugar A, Meyer RF, Soong HK, Musch DC, et al. The utility of culturing corneal ulcers in a tertiary referral center versus a general ophthalmology clinic. Ophthalmology 1997;104:1897-901. Wilhelmus KR, Liesegang TJ, Osato MS, Jones DB. Laboratory diagnosis of ocular infections. Cumitech. Vol. 13. Washington, D.C: American Society for Microbiology; 1994. Forster RK. Conrad berens lecture. The management of infectious keratitis as we approach the 21st century. CLAO J 1998;24:175-80. Antibiotic resistance and topical treatment. Br Med J 1978;2:649-50. Havener WH. Antibiotics. In: Ocular Pharmacology. 5th ed. St Louis: The C.V. Mosby Co.; 2000. p. 120-210. American Academy of Ophthalmology, Basic and Clinical Science Course Subcommittee. Basic and Clinical Science Course. External Disease and Cornea: Section 8, 2013-2014. San Francisco, CA: American Academy of Ophthalmology; 2013. p. 152.